Like most frogs, they may be at risk for fungal diseases, habitat loss, and pesticide exposure. They are mainly shades of grey with brown or green pigmentation patterns on the back. This blotchy pattern resembles lichen and helps the Gray Tree Frog blend in to its surroundings. They have a white spot beneath each eye and a stripe running from the eye to the legs. The male of this species is larger. They are 6 cm snout to vent. Reproduction takes place after the winter season is over (around April). The males will defend their territory by fights that last 30-90 seconds. The male and female will float on top of the water while the eggs are being fertilized. Eggs are laid in shallow pools and tadpoles emerge after a few days. The tadpoles are small and somewhat fishlike in appearance. After 2 to 2.5 months they transform, or metamorphose, into young frogs. They are carnivorous, feeding on spiders, crickets, moths, roaches, and other invertebrates. This is a nocturnal species. Males produce a loud, musical call for hours after dusk. 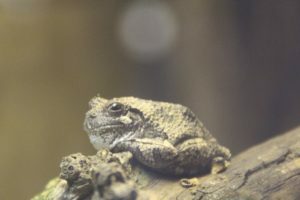 The Gray Tree Frog will hibernate up in the trees. 1. The yellow coloration of the groin and legs helps to confuse or deter predators. 2. They can produce a natural antifreeze called glycerol that prevents cell damage in subfreezing temperatures. 3. They are able to partially change the color of their skin to make it darker or lighter (lighter at night and darker during the day), and from gray to green.